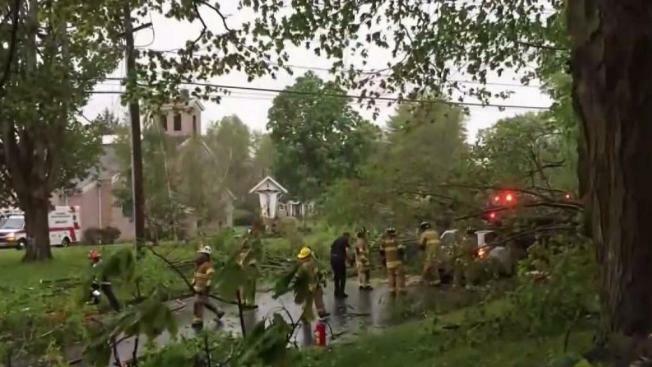 The National Weather Service has confirmed that five tornadoes touched down in New York and in Connecticut Tuesday. An EF0 tornado with estimated peak winds of 85 mph hit near Newburgh in Orange County, moving through a path of 674 yards -- in addition to two earlier confirmed tornadoes in Putnam County, an EF2 with estimated peak winds of 110 mph in Kent, and an EF1 with 100 mph winds in Patterson. The NWS added late Wednesday that it's confirmed two EF1 tornadoes in New Haven, Connecticut: one that moved along a 9.5-mile path between Beacon Falls and Hamden with estimated peak winds of 110 mph, and another that moved along a 4.5 mile path between Southbury and Oxford, with estimated peak winds of 100 mph. NWS also said Wednesday that a macroburst with max sustained winds up to 90 mph had impacted a 4 mile-long area in nearby Cherry Hill, and a macroburst with maximum wind speeds of up to 110 mph impacted a swath of about two and half miles in width and five miles in length in the Fairfield County town of Brookfield in Connecticut. A macroburst with wind speeds in the 85 to 105 mph range also happened along the I-84 corridor roughly between Beacon/Wappingers Falls and East Fishkill/Hopewell Junction in southern Dutchess County, the NWS says. Elsewhere, a microburst -- an intense column of sinking air within a thunderstorm -- with estimated winds gusting to 80 mph rolled through the area near North Salem in Westchester County, downing about 250 yards worth of trees, the NWS said. The monstrous storm system was the most severe weather the tri-state area has seen this spring, so ferocious it generated a small tsunami in New Jersey, killed nearly a half-dozen people and paralyzed virtually the entire region at the height of the evening commute. Few spots were spared the intensity. The damage was extensive in Newburgh: residents and businesses on storm-ravaged Liberty Street were without power Wednesday, a day after roofs were peeled off and bricks were torn from buildings there. "It just sounded like a freight train," Courtney Dilger recalled. "I was legitimately scared we were actually having a tornado. In New Fairfield, Connecticut, where cleanup is expected to take days, "going through the center of town, it literally looks like a bomb went off," said Thomas Wilkeson. "I've been in Connecticut 46 years, but I never seen anything ever happen like this before," said another New Fairfield resident, Suresh Selviah. The nightmare storms, which knocked out power to hundreds of thousands, have been blamed for at least five deaths in the region, including an 11-year-old girl in Newburgh. All victims were crushed to death by fallen trees. Restaurants on Liberty Street in Newburgh decided to make the best of the situation and hold a cookout rather than let good food go to waste. "The chefs decided to have a barbecue to give to the community," said one business owner, Amal. "Yesterday was so sad. Today, everybody seemed in better spirits." Uprooted trees were reported across the Garden State, too. In Ho Ho Kus, a tree fell on Bernard Place, hitting a house and car; houses were also seen crushed by trees in Wyckoff and Scotch Plains, along with live downed wires. A lightning strike is thought to be the culprit for a car fire on Route 46 in Clifton. 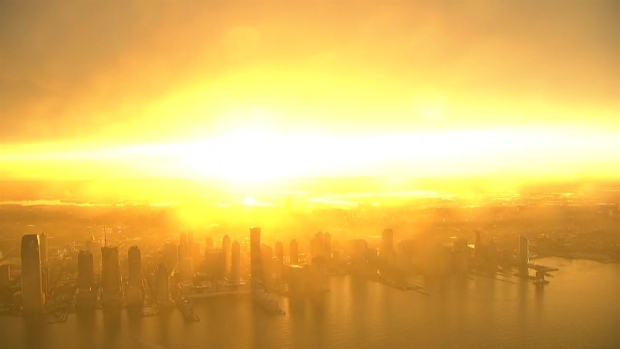 This time-lapse shows a beautiful view of the sun breaking through the clouds after the storm, as seen from One World Trade Center.